New Years Eve cake to kick 2018 to the curb. Happy almost New Year! 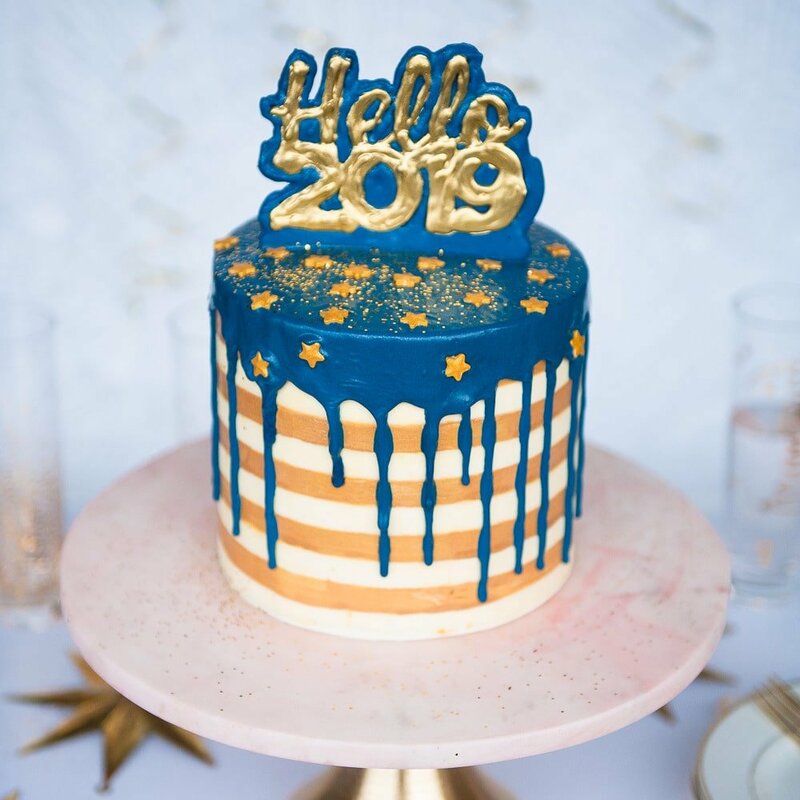 I don’t know about you but I’m really excited to say goodbye to 2018 and ring in 2019! I just have a feeling it’s going to be an awesome New Year. Last years New Years Eve cake was a big hit and people who had never tried pink champagne cake are now in love! 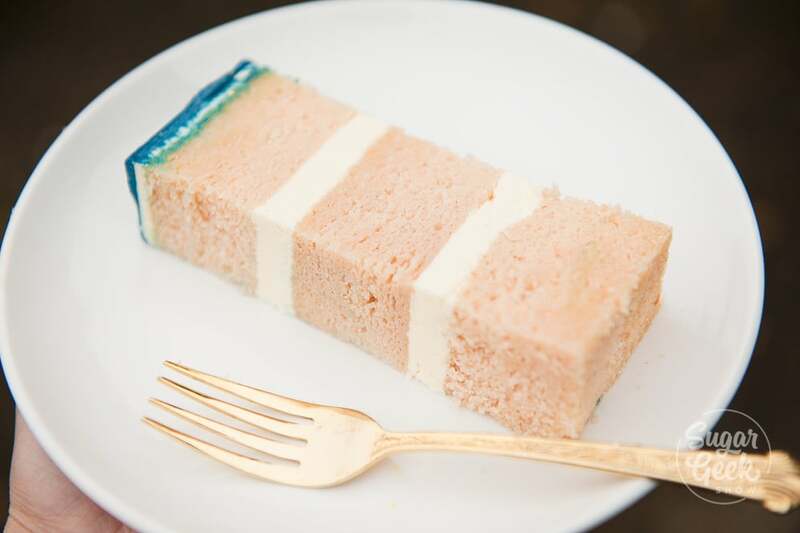 I totally get it, I love me some pink champagne cake too and it has such a tasty flavor. For this year, I’m creating something a bit different! I’m trying out my new cake combs from Ester Cakes to make some buttercream stripes. They have a whole bunch of different patterns and styles! Works really great on ganache too. 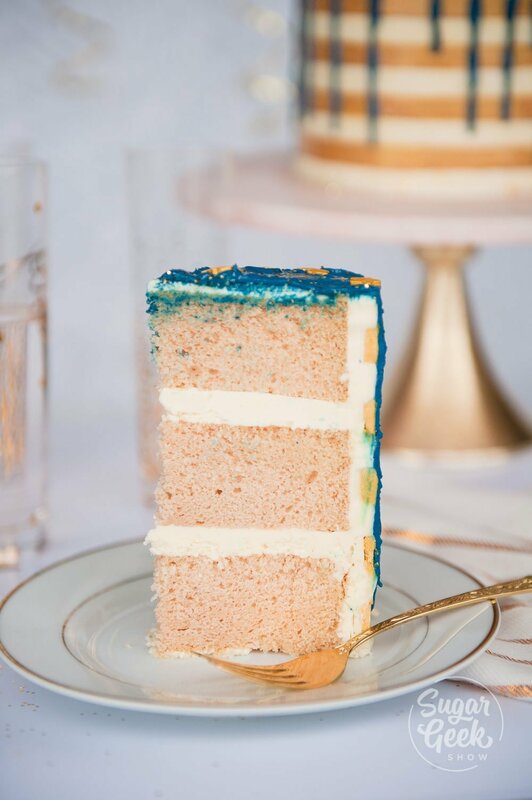 To make my drip cake, I start off with three 6″ layers of my pink champagne cake and stack and fill them with easy buttercream frosting. I get a quick crumb coat on there then chill 15 minutes. After chilling, I smooth the layers down as usual with my bench scraper. 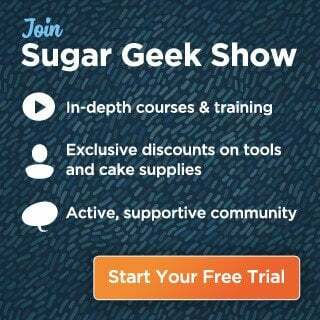 If you need some more tips on how to bake and decorate your first cake, check out my beginner cake decorating tutorial on how to make your first cake ever. After I got my cake smooth I chilled the cake again for about 20 minutes. 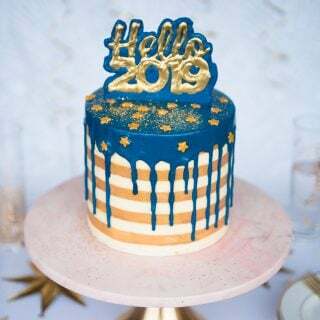 To make the buttercream stripes on your New Years Eve cake, you take the Ester Cakes cake comb and slowly start scraping away buttercream to make the stripe indents. I go nice and slow and take my time. Then after my comb hits the board, I chill the cake for about an hour so that the buttercream is really hard! That way the stripes don’t get messed up later. After the cake is chilled, I add some gold colored buttercream. I colored my buttercream with some ivory food coloring gel to make the gold color. Scrape away the excess buttercream with your smooth bench scraper to reveal your stripes! Pretty cool huh! For the chocolate cake topper, simply melt down some candy melts. Place them into a piping bag with the tip cut off. 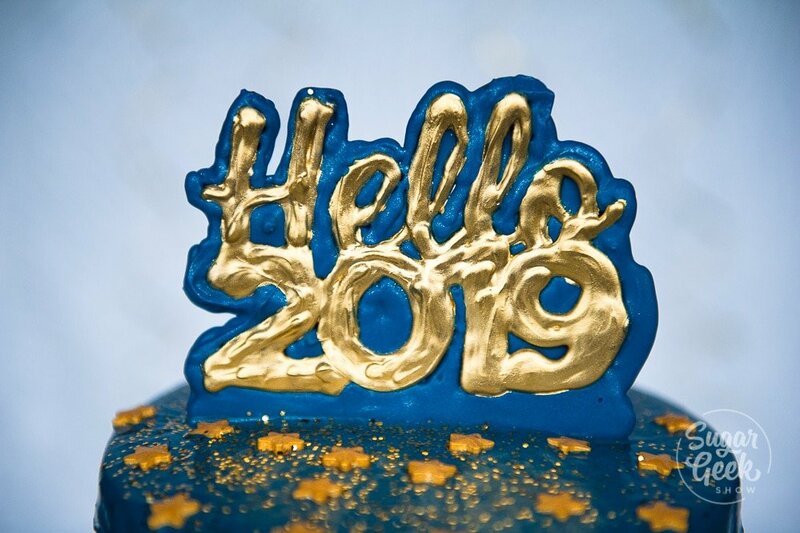 Print out the free New Years Eve chocolate cake topper template. Place some parchment paper over the top of template #2 and just trace the image with your piping bag. I chilled mine in the fridge for about 5 minutes to make it set up. After the word is piped you can paint it gold. I used Edible Artist Decorative paints glamorous gold because it’s fully edible and has a nice pretty shine. It takes a couple of coats for complete coverage on chocolate just FYI. Once that’s set, I pipe the #1 template onto some parchment paper the same way we did the first one. You’ll notice this one is a bit thicker and bolder. That’s so that we can place the chilled word on top and it will have an outline. Finish the topper off with a little cake pop stick for placing into the cake. To make our water ganache drip, simple melt down 6 oz of your colored candy melts. I used Wilton royal blue. Then add in 1 oz of hot water and mix until it’s a smooth consistency. I added in some more blue food coloring and a touch of black to make my drip more of a royal blue in color. Adding food color gel to water ganache will not make it seize up. Place your water ganache into a piping bag with the tip cut off and begin piping around the outside edge of your cake. once you get all the way around, squeeze the excess into the center of the cake and smooth it out with your spatula. All that’s left to do now is to add some gold star sprinkles and place your chocolate cake topper on top! 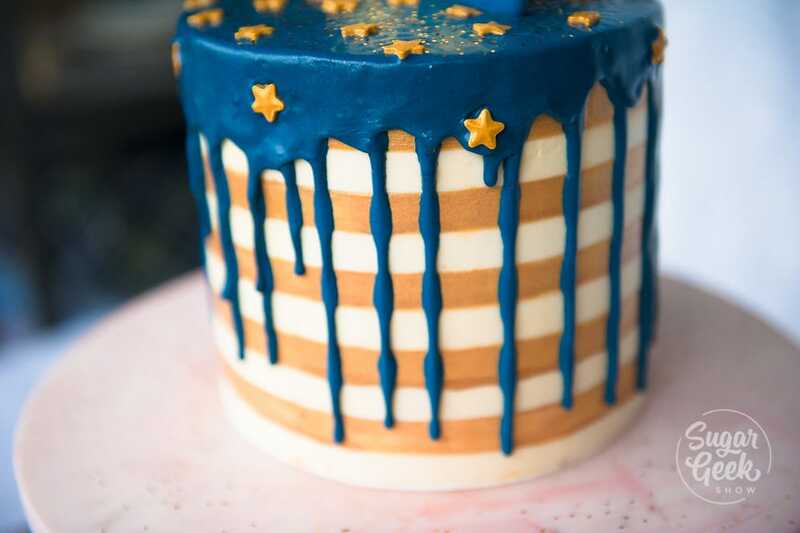 I love how the blue water ganache drip reminds me of a melting starry night sky. 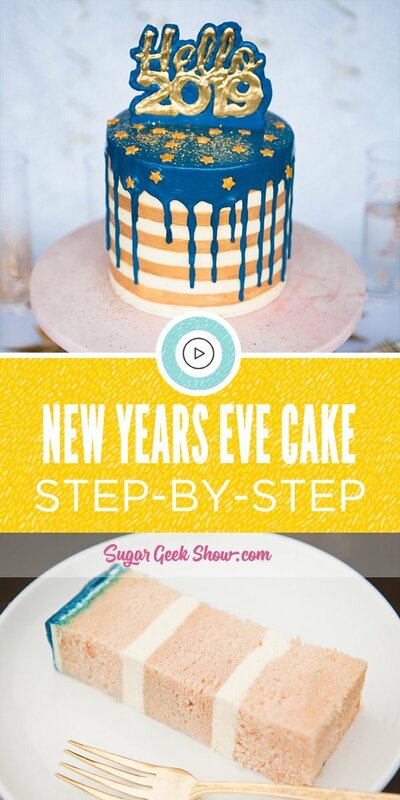 I hope you enjoyed this simple and fun New Years Eve cake tutorial! If you have any questions, just leave them for me in the comments section and I’ll get back to you. 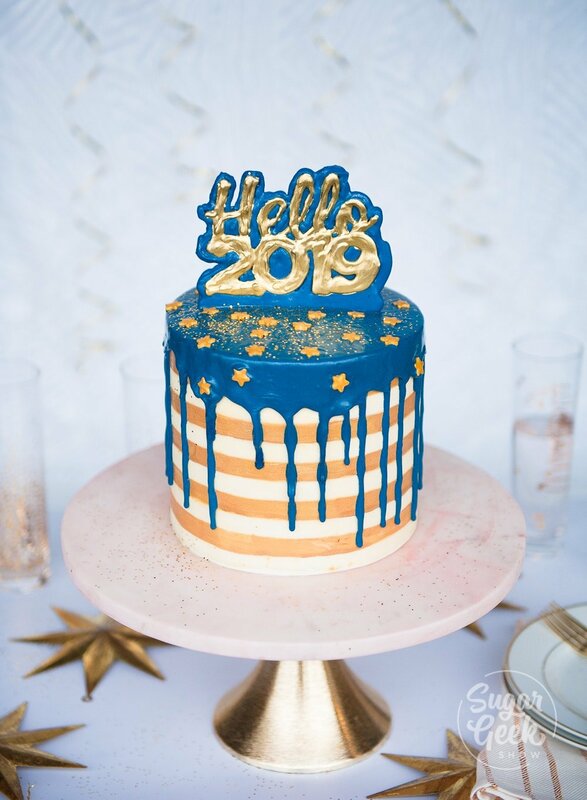 Ring in the New Year with this fun and festive pink champagne cake covered in white and gold buttercream stripes, water ganache drip and a yummy chocolate cake topper! Divide into two 8" round pans. Bake for 25-30 mins until a toothpick comes out clean. Let cool and then chill before trimming and stacking your cakes. Melt down your white chocolate until they are almost melted. Stir with a spoon until completely melted then add in your hot water. Stir until combined and smooth. 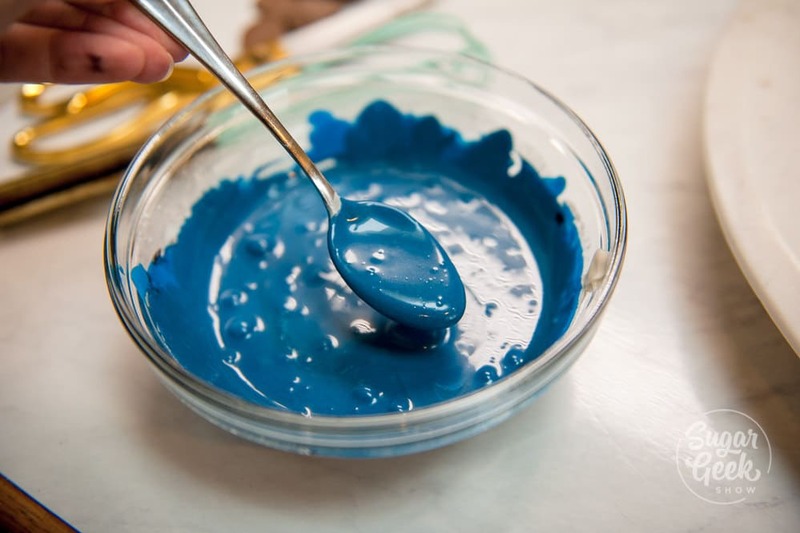 Add in a couple of teaspoons of dark blue food coloring if you want a darker blue. Place powdered sugar, egg whites, vanilla and salt into the bowl of a stand mixer with the whisk attachment. Whip on high for 5 minutes then add in butter on low in small chunks. Once all the butter is added, go back up to high until the buttercream is thick and white. This can take ten minutes. Take out two cups of the buttercream and color it with ivory food color gel and mix until you don't see any streaks. I am not sure what white baking chocolate is but I dont see why not if it tastes good to you.